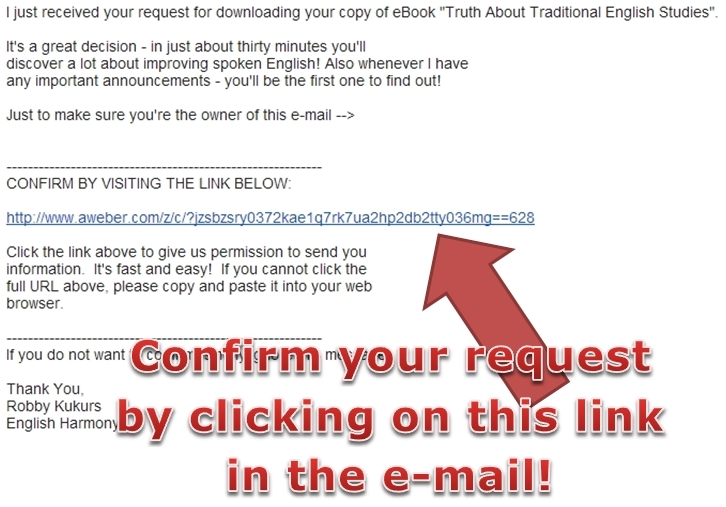 Please Check Your e-Mail and Confirm Your eBook’s Request! You can see BELOW what the actual e-mail looks like in your inbox so that you don’t miss it! By confirming your e-mail you will be subscribed to my mailing list. You’ll be receiving informative videos, valuable English improving info and other cool stuff from me in the future. I’ll be discussing various aspects of English fluency and I really hope you’ll enjoy reading my e-mails! What you’ll be getting from me is – ONLY English fluency related videos, news articles, and my website’s updates! I am a new learner to get english fluency method. Please advice to me.how to learning is the best way for me? hii guis i am new student i wanna lern english what should bee done for it plz suggest me. You’re really out of the world.Thanks so much. Keep doing. Go to way!!!! Check your spam folder! Your e-mail client may have re-directed the confirmation e-mail to spam – especially if it’s Hotmail you’re using! great teacher! thanks a lot! Thanks for introducing yourself, I hope you’ll enjoy reading my articles and watching my videos! Hi, bro, you seem really great in your description upon how to get fluency in English. I’m a man of great enthusiasm about speaking fluent English. I’m a Burmese. Thank you so much, Let me know can I find your page on Facebook? i recieve ur email for free practicle english grammer…….but the is not open ……..not supported said……..so plz…..
so many thanx admin,,,,,this page is very usefull for us to learn english. I’m not really an English teacher – this blog is for those who’ve already achieved a decent level of written English and comprehension; this blog deals with oral fluency and confidence issues. Basically what I’m trying to say is – if you need to LEARN correct grammar, vocabulary etc, I can’t really provide much advice because I’m providing fluency mentoring. Thanks a lot,it is a great way to be fluent. thanks i was searching from long time this type of phrases. thanks a lot for your efforts of making english students fluent speakers, you are such a smart and wise. i have visited your blog several times but i have not figured out the chance of receiving information freely. thanks again. Thank you so much Robby.. Thanks Roby I love reading your weebsite I will be really happy to receive your email.